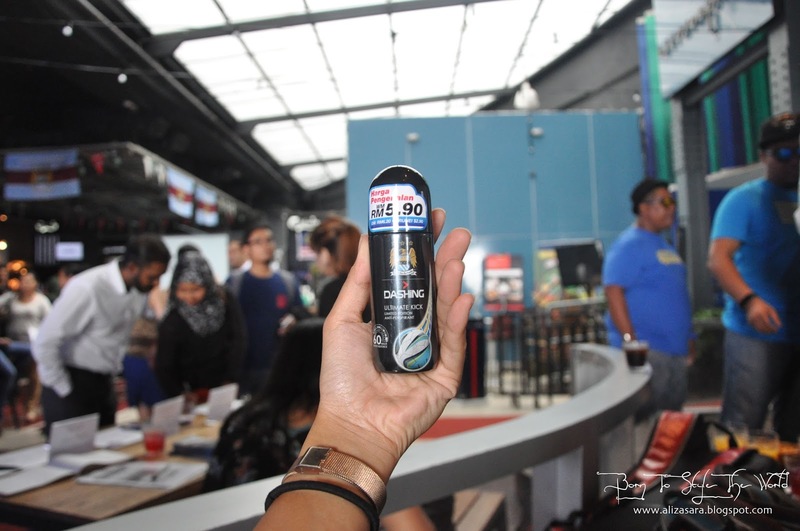 Dashing is 'the' Malaysia's first male body care brand, which has been launched over 25 years ago, releasing a wide range of men care products, making them the market leader amongst the young malay society in Malaysia. 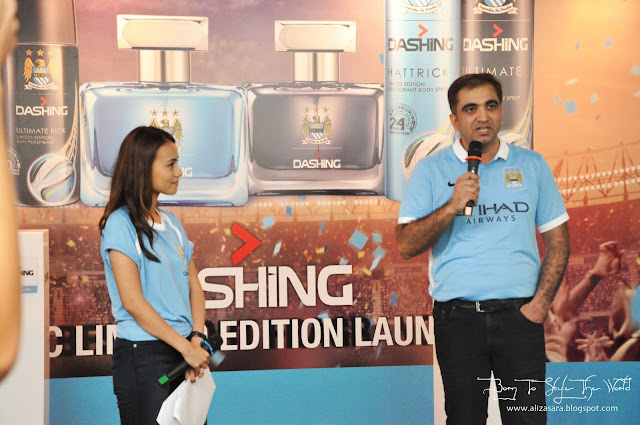 I was invited to the Dashing MCFC Limited Edition launch, and i cant wait to share to you men about the latest scents for sporty personalities. 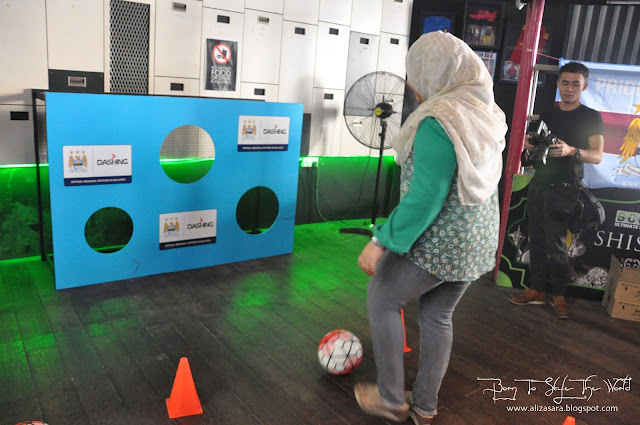 And yes, Dashing has officially had their sights set firm on the nations favourite sport; football featuring MCFC in their Limited Edition range. We had some games too during the event. 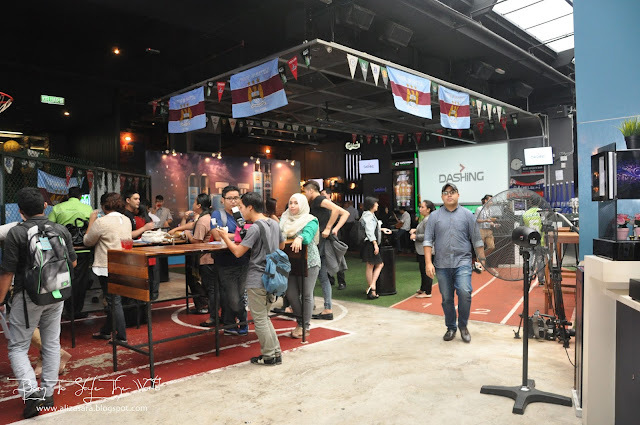 I was told that Dashing & Manchester City Football Club has been partners for almost a year and after creating some exciting footballing experiencea last season, they are proud to present you the new collection of ETDs, Deidarants and Roll Ons to provide a world class experience to sporty Malaysian fans. For your information, the entire limited edition range is truly inspired by MCFC, from the packaging, colour themes, right down to their frangrances, formulated to last longer and provide freshness theoughout the day. Presenting to you the two variety of scents named "Ultimate Kick" and "Hattrick". Presenting to you the Limited Edition range by Dashing. The Ultimate Kick has specially created its scent for champions, bringing out the suave side in every facade if a modern man. The scent itself features a summer-like active frangrance featuring notes loke lemon, cardamom supported by vanilla with a musky base. Hattrick on the other hand has a winning strike of its own, uncomparable with the Ultimate Kick. The scent represents a scent of energy which has a combination of apple with a tinge of citrus, infused with floral notes and a hint of amber. Dashing MCFC Deo Roll on. Dashing understand the need of staying freah and focused in their daily lives, by introducing the new Dashing MCFC Deo Spray & Roll on which provides 6 all in one bottle. Its longlasting, kills odour, prevents stain, quick drying formula, prevents bacteria and brings freshness throughout the day. Photo credits : Daily mail. 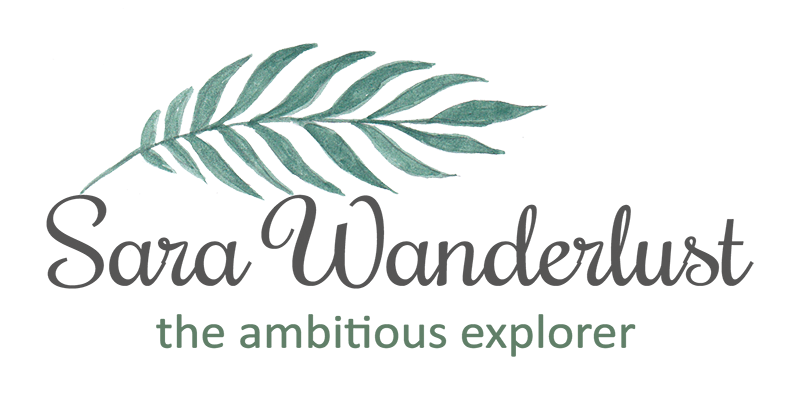 To add a little excitment to the launch, Dashing has decided run a contest for 11 lucky winners to go in a 6 day 5 nights fully paid trip to Manchester, UK! 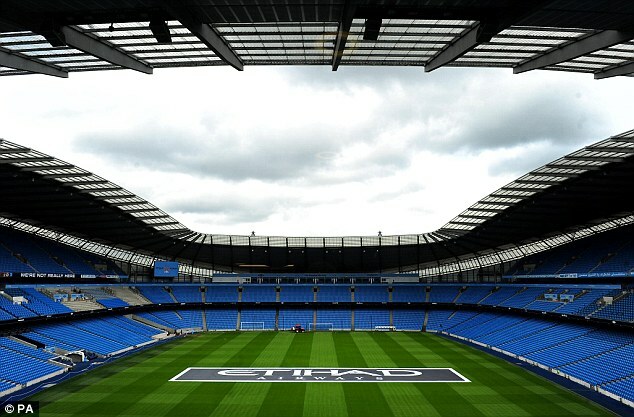 The trip will include a 3 day training camp at the City Football Academy with coaches, a meet and greet session with 1st team players, an Etihad Stadium Tour and best of all, VIP tickets to watch a LIVE match between Manchester City & Manchester United on the 19th March 2016. How crazy is that guys? Mr Rishi Pahwa, Marketing Manager of Dashing giving a speech. Freestyler footballer performance showing us some killer stunts. The launch was official once the event kicked off with a freestyler footballer performance by Malaysia's Top Freestyle Footballer who impressed the attendees for the day. Dashing MCFC range was also unveiled in Manchester in a pre season event at the Etihad Stadium. There you have it! So boys, get it while still can, and if youre a lady reading this, why not get it for him as a birthday present or as a gift to surprise him with a frangrance inspired by his favourite football team? For more information, do head on over to https://www.facebook.com/Dashing.MY. Mandatory group photo with the bloggers! From left: Miera, Me, Ayu, Ella and Tommy! Supposed to go there but was stuck in my meeting. :( Looks like a fun day out even though it's for the dull blue side of Manchester. HAHA Tommy looks like a giant next to you girls xD Btw, did anyone manage to kick into the top hole? It's wonderful to see how far Dashing has come these past years. I still remember the early days of the company with just a couple of products for men. my son love this product too, didn't make it for the event the day. Who win the most prizes? Wow limited edition leh. Never use Dashing brand product but definitely will get a try one day! Lovely packaging and makes a great gift for Christmas and other occasions gifts. The prize looks tempting though! Is looks like a good present choice for boyfriend and brothers hehe. Thanks for the sharing! but.. i'm not there! hahaha :) nice coverage of a good event. Hmmm.... Not really a fan. But thanks for sharing. Good luck to those who is going. How fantastic! I will check this one out. I think my boyfie will like this. Woosh, Tommy is tall. Good luck to all that's gonna join! [BEAUTY] Davines ; Sustainable Haircare.